The Ilyushin Il-76 (NATO reporting name: Candid) is a multi-purpose four-engined strategic airlifter designed by the Ilyushin design bureau. It was first planned as a commercial freighter in 1967. 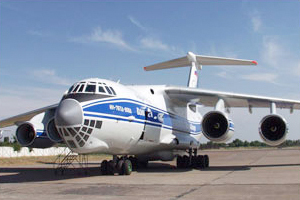 Intended as a replacement for the Antonov An-12, the Il-76 was designed for delivering heavy machinery to remote, poorly-serviced areas of the USSR. The aircraft was first conceived by Ilyushin in 1967 to meet a requirement for a freighter able to carry a payload of 40 tons (88,000 lb) over a range of 5,000 km (2,700 nmi; 3,100 mi) in less than six hours, able to operate from short and unprepared airstrips, and capable of coping with the worst weather conditions likely to be experienced in Siberia and the Soviet Union’s Arctic regions. The Il-76 is also in use as an airborne tanker, otherwise known as a refueller (Il-78, some 50 were made), and a waterbomber. Its airframe was used as a base for the Beriev A-50 ‘Mainstay’ AEW&C (airborne early warning and control) aircraft (some 25 were made).